Arthur K. Wheelock Jr., “Frans Hals/Adriaen van Ostade/1646/1648,” Dutch Paintings of the Seventeenth Century, NGA Online Editions, https://purl.org/nga/collection/artobject/77 (accessed April 22, 2019). Hals depicted his colleague the artist Adriaen van Ostade (1610–1685) as a refined gentleman wearing fashionable apparel, including the gloves that were an essential accessory of the social elite in this period. Van Ostade holds his right glove in his left hand, and his casual pose adds to the lifelike character of the portrait, further reinforced by the extraordinary abstract brushwork. Prior to entering Haarlem’s Saint Luke’s Guild in 1634, Van Ostade had probably been Hals’ pupil. He specialized in scenes of peasant life, such as The Cottage Dooryard in the National Gallery’s collection. In 1647 Van Ostade was elected to serve as one of the headmen of the Saint Luke’s Guild, so he may have commissioned Hals to paint his portrait to commemorate this high point in his career. It has been proposed that a painting in the National Gallery of Canada, Ottawa, Seated Man Holding a Branch (inv. no. 15, 901), may also represent Van Ostade. The attribution of this work and the identification of the sitter, however, have been debated. The work is attributed to Frans Hals by Seymour Slive (in Frans Hals, 3 vols. [London, 1970–1974], 3: no. 155, and in Frans Hals [Washington, DC, 1989], 298, no. 59), but to Frans Hals the Younger by Claus Grimm in “Frans Hals und seine Schule,” Münchner Jarbuch der Bildenden Kunst 22 (1971): 162, no. 15, 171, repro. 25, and to Workshop (Group B) by Grimm in Frans Hals: The Complete Work, trans. Jürgen Riehle (New York, 1990), 292. Although the model shares a certain likeness to the sitter in the Washington painting and even more closely resembles the previously mentioned mezzotint by Jacob Gold after a lost painting by Cornelis Dusart, no firm conclusion can be made about the sitter’s identity (see Slive, Frans Hals [London], 3: fig. 46; Ernst Scheyer, “Portraits of the Brothers Van Ostade,” Arts Quarterly 2 : 134–141). 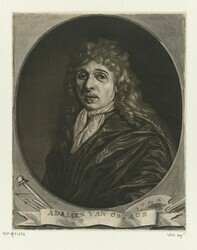 If the Ottawa portrait does represent Van Ostade, its proposed date of 1645 presents some difficulties, for Van Ostade was born in 1610 and the figure appears older than thirty-five. Slive, Frans Hals (London), 3: fig. 47, discusses a copy of a lost Van Ostade self-portrait by Jan van Rossum (active c. 1654–c. 1673) now in the National Gallery of Ireland, Dublin; see Homan Potterton, Dutch Seventeenth and Eighteenth Century Paintings in the National Gallery of Ireland: A Complete Catalogue (Dublin, 1986), 132–133, no. 623, fig. 141. No conclusions about the identification of the Washington sitter can be made, however, from this image. Seymour Slive, ed., Frans Hals, 3 vols. (London, 1970–1974), 3: nos. 203, 206. Ironically, Hals’ works representing a painter with the tools of his craft have remained unidentified (Art Institute of Chicago, inv. no. 94.1023, see Slive, Frans Hals [London], 3: no. 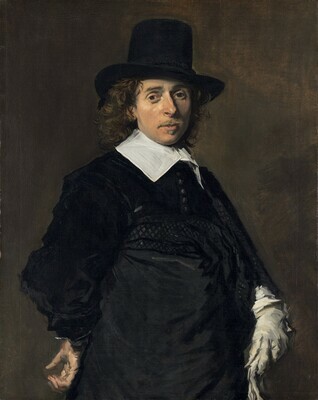 164; and Frick Collection, New York, see Slive, Frans Hals [London], 3: no. 186). Unfortunately, his portraits of fellow-painters Jan Miense Molenaer, Judith Leyster, Thomas Wyck, and Jan van de Cappelle, and of the painter-architect Jacob van Campen, are now lost. At a College Art Association meeting on February 11, 2010, Paul Crenshaw has, however, proposed that Portrait of a Painter Holding a Brush in the Frick Collection is a pendant to Portrait of a Seated Woman Holding a Fan in The Metropolitan Museum of Art, New York, and that the sitters are Jan Miense Molenaer and Judith Leyster. See Slive, Frans Hals (London), 3:96–97, nos. 186, 187. David R. Smith, Masks of Wedlock: Seventeenth-Century Dutch Marriage Portraiture (Ann Arbor, 1982), 78. See also Berent Schwineköper, Der Handschuh im Recht, Ämterweisen, Brauch und Volksglauben (Berlin, 1938), 127–128. and it may be significant that in both of these instances the right hand, the one used for greeting, has been ungloved. Its position, with the palm exposed to the viewer, reinforces the quality of openness and forthrightness evident in these works. Seymour Slive, ed., Frans Hals, 3 vols. (London, 1970–1974), 3: no. 173, fig. 268, note. 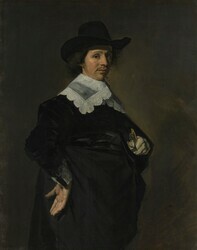 By the early 1650s Hals’ style had become less agitated, as a comparison with the National Gallery of Art’s Portrait of a Gentleman demonstrates. At that time he blocked in the silhouettes of his figures with broad, angular strokes rather than with the broken contours that characterize his work from the late 1640s. The explicit virtuosity of his technique for rendering Van Ostade’s gloves with rapidly applied diagonal accents later gave way to simpler forms with more measured rhythms. I would like to express my appreciation to H. Rodney Nevitt Jr., for his assistance in preparing this entry. Buckston family, Sutton on the Hill, Derbyshire; (sale, Sotheby & Co., London, 5-6 May 1919, 2nd day, no. 285); Brown, acting for (Thos. Agnew & Sons, Ltd., Arthur J. Sulley & Co., and Colnaghi & Co., London); purchased 9 May 1919 by (M. Knoedler & Co., London and New York); sold 1 November 1919 to Andrew W. Mellon, Pittsburgh and Washington, D.C.; deeded 28 December 1934 to The A.W. Mellon Educational and Charitable Trust, Pittsburgh; gift 1937 to NGA. In this auction the picture was listed as Portrait of the Artist by Nicholas Berghem [Berchem]. The auction catalogue states that the painting was "The Property of a Gentleman". Francis Russell of Christie's kindly provided the name of the family that consigned the painting (letter of 10 March 2003 to Arthur Wheelock, in NGA curatorial files). The fact that the purchase was by joint account of the three dealers is given in the Public Collections section of The Getty Provenance Index Databases. The painting was Agnew’s joint account number J-1817 and Colnaghi’s number A-720. Colnaghi also sold one third of their share to H.M. Clark. Christopher Kingzett of Agnew’s confirmed Agnew’s purchase of the painting at the 1919 sale, but does not mention the joint account with Sulley and Colnaghi (letter, 7 March 1984, to Arthur Wheelock, in NGA curatorial files). Letter, 14 February 1984, Nancy Little, Librarian at M. Knoedler & Co., to Arthur Wheelock, in NGA curatorial files. Knoedler’s recorded their purchase as from Agnew’s; the painting was Knoedler stock number 14774. Paintings by Old Masters from Pittsburgh Collections, Carnegie Institute, Pittsburgh, 1925, no. 24, as Nicholas Berghen [Berchem]. The support, a fine-weight, plain-weave fabric, has been lined with the tacking margins trimmed. Cusping indicates no change in dimensions. Lining has reinforced the impression of the canvas texture in the paint surface. The smooth, white ground layer is visible through the transparent background paint, appearing light brown to the eye. Paint is applied freely in thin layers defined by broad, distinct, sure brushstrokes. A dark layer was applied first to serve as a color for the background and an underpaint layer for the jacket, with reserves left for the face and hands. The face, collar, hands, and gloves were brought to a higher degree of finish in fuller bodied paint with brushwork blended wet-into-wet. X-radiographs show a minor adjustment to the right half of the collar, which was initially straighter. The entire collar may have been slightly smaller. Two small losses are found above and below the mouth on the left side, along with scattered small losses in the lower half of the jacket. The black paint of the jacket is moderately abraded and a 3-centimeter section of hair to the left of the face is severely abraded. The painting was treated in 1990 to remove discolored varnish and inpainting. Carnegie Institute. An Exhibition of Paintings by Old Masters from the Pittsburgh Collections. Exh. cat. Carnegie Institute, Pittsburgh, 1925: no. 24. Valentiner, Wilhelm R. "New Additions to the Work of Frans Hals." Art in America 23 (June 1935): 86-103, no. 21, fig. 2. Valentiner, Wilhelm R. Frans Hals Paintings in America. Westport, Connecticut, 1936: no. 100, repro. Preliminary Catalogue of Paintings and Sculpture. National Gallery of Art, Washington, 1941: 95, no. 70, as Portrait of a Man. National Gallery of Art. Book of illustrations. 2nd ed. Washington, 1942: no. 70, repro. 24, 240, as Portrait of a Man. National Gallery of Art. Paintings and Sculpture from the Mellon Collection. Washington, 1949 (reprinted 1953 and 1958): 79, repro. Walker, John. National Gallery of Art, Washington, D.C. New York, 1963 (reprinted 1964 in French, German, and Spanish): 337, 312, repro., as Portrait of a Man. National Gallery of Art. Summary Catalogue of European Paintings and Sculpture. Washington, 1965: 65, as Portrait of a Man. National Gallery of Art. European Paintings and Sculpture, Illustrations. Washington, 1968: 58, repro., as Portrait of a Man. Grimm, Claus. "Ein meisterliches Künstlerporträt: Frans Hals’ Ostade-Bildnis." Oud Holland 85 (1970): 146-178, fig. 24. Slive, Seymour. Frans Hals. 3 vols. National Gallery of Art Kress Foundation Studies in the History of European Art. London, 1970–1974: 1(1970):190-191, fig. 203; 2(1970):fig. 303; 3(1974):78-79, 99-100, no. 192. Grimm, Claus. "Frans Hals und seine Schule." Münchner Jahrbuch der Bildenden Kunst 22 (1971): 146-178, fig. 24. Grimm, Claus. Frans Hals: Entwicklung, Werkanalyse, Gesamtkatolog. Berlin, 1972: 105-106, 204, no. 122, figs. 136-138, 142. Montagni, E.C. L’opera completa di Frans Hals. Classici dell’Arte. Milan, 1974: 105, no. 72, repro. National Gallery of Art. European paintings: An Illustrated Summary Catalogue. Washington, 1975: 170, repro., as Portrait of a Man. Walker, John. National Gallery of Art, Washington. New York, 1975: 268-269, no. 356, repro. Montagni, E.C. Tout l'oeuvre peint de Frans Hals. Translated by Simone Darses. Les classiques de l'art. Paris, 1976: no. 72, repro. Baard, H. P. Frans Hals. New York, 1981: 138. Walker, John. National Gallery of Art, Washington. Rev. ed. New York, 1984: 268, no. 350, color repro. Sutton, Peter C. A Guide to Dutch Art in America. Grand Rapids and Kampen, 1986: 308-309. Middelkoop, Norbert, and Anne van Grevenstein. Frans Hals: Life, Work, Restoration. Translated by Rollin Cochrane. Gloucester, 1988: 72-73, repro. Grimm, Claus. Frans Hals: The Complete Work. Translated by Jürgen Riehle. New York, 1990: 46-49, fig. 40e, 256, fig. 104b, 287, no. 123, repro. Wheelock, Arthur K., Jr. Dutch Paintings of the Seventeenth Century. The Collections of the National Gallery of Art Systematic Catalogue. Washington, 1995: 79-83, color repro. 81. Wheelock, Arthur K., Jr., and Michael Swicklik. "Behind the Veil: Restoration of a Dutch Marine Painting Offers a New Look at Seventeenth-Century Dutch Art and History." National Gallery of Art Bulletin no. 37 (Fall 2007): 2, 4, fig. 2. An old label from the back of the painting (now in National Gallery of Art curatorial files) reads: “3. Portrait of Berghem, the celebrated Painter. By himself. Small half-length, curved gilt frame.” A painted inscription on the back reads “Nicholas Berghem.” The identification may have been made by an English owner during the nineteenth century, when Dutch Italianate paintings were in vogue. Since collectors and connoisseurs often associated an artist’s appearance with his type of subject matter, the identification of this handsome and refined sitter as Berchem, a painter of elegant views of the Roman campagna, is understandable. 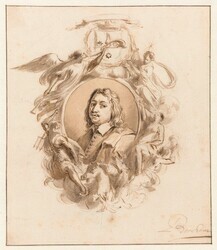 Claus Grimm, “Ein meisterliches Künstlerporträt: Frans Hals’ Ostade-Bildnis,” Oud-Holland 85 (1970): 170–176. Albert Blankert, Museum Bredius: Catalogus van de Schilderijen en Tekeningen (The Hague, 1978), 95–96, no. 121. Claus Grimm, “Ein meisterliches Künstlerporträt: Frans Hals’ Ostade-Bildnis,” Oud-Holland 85 (1970): 173. Eduard Trautscholdt, “Zu einer Bildniszeichnung des Adriaen van Ostade,” Miscellanea I.Q. van Regteren Altena (Amsterdam, 1969), 153. Arnold Houbraken, De groote schouburgh der Nederlantsche konstschilders en schilderessen, 3 vols. (Amsterdam, 1718–1721; rev. ed., The Hague, 1753; reprint, Amsterdam, 1980), 1:347. Seymour Slive, ed., Frans Hals, 3 vols. (London, 1970–1974), 3: no. 144. David R. Smith, Masks of Wedlock: Seventeenth-Century Dutch Marriage Portraiture (Ann Arbor, 1982), 78. See also Berent Schwineköper, Der Handschuh im Recht, Ämterweisen, Brauch und Volksglauben (Berlin, 1938), 127–128. National Gallery Scotland, Paintings in the National Gallery of Scotland (Edinburgh, 1976), 47, no. 691; Seymour Slive, ed., Frans Hals, 3 vols. (London, 1970–1974), 3: no. 156, note. Claus Grimm, Frans Hals: Entwicklung Werkanalyse, Gesamtkatolog (Berlin, 1972), 106, dates the painting 1643–1644; Seymour Slive, ed., Frans Hals, 3 vols. (London, 1970–1974), 3: 99, no. 193, dates it 1650–1652. Seymour Slive, ed., Frans Hals, 3 vols. (London, 1970–1974), 3: no. 173, fig. 268, note.